Ganon exercised his chilling powers by causing the lake in the southwest to freeze and by creating a storm cloud to cover the area with snow. It serves adventurers of this region well to wear gear that will protect them from the elements. The creatures who survived the sudden change of weather are said to be very tough. Zirros and Pikits rule on the land, and a band of Zora's Spawn took over the cold waters of the lake. The subjects of the Golden Land who survived stay in caves and buildings. The Item Shop in this region is stocked with the standard goods. Adventurers in need of Potions, Bombs, or a Shield can stock up here. The Potion is especially useful as enemies in this area are dangerous. The odd creature in the cave on the northeast shore of the lake will confess to having been a former thief. 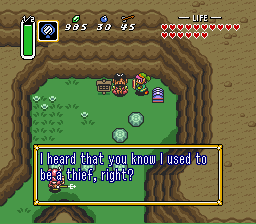 For a price of 20 Rupees, he will tell visitors the story of another former thief who was an old friend of his that could open locked Treasure Chests with ease. 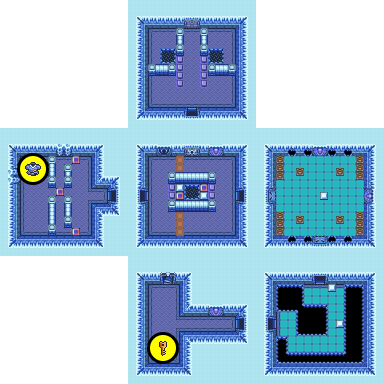 The next crystal that you wish to obtain can be found in the Ice Palace. But before we dive right in, there are a few errands that you can take care of, especially now that you have the Titan's Mitt. From the earliest moments of your quest, you heard about a sad blacksmith near Kakariko Village. The poor fellow has lost his partner and could no longer excel at his craft. Not until you reach that Dark World, however, can you help the blacksmith. 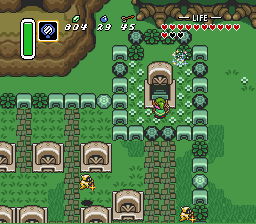 During one of your explorations south of the village, you may find a frog trapped by skulls. If you free the frog, you can take it back to the blacksmith. Upon his return to the Light World, the frog will be restored to his former blacksmith self. The two partners will be overjoyed to be reunited after so many years apart. 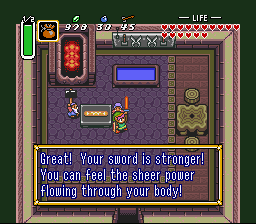 In a display of gratitude, they will take your Master Sword and strengthen it. It will take some time, but you will receive the Tempered Sword in return. Outside the Smith's house near the village is a stake blocking a place where you can jump into a well. Using the Magic Hammer, pound the stake and jump into the well. In the well, sprinkle magic powder on the statue. You will find a strange creature who claims to take away half of your magic power when, in fact, he actually doubles it. 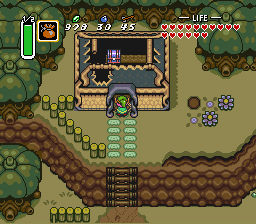 The Blacksmith's house in the Dark World is a shattered shell in which a locked trunk sits. The trunk will only appear after you have returned the Dwarf Blacksmith to his partner. When you discover the trunk, you won't find a key to open it with, and whacking the trunk with your sword does nothing. 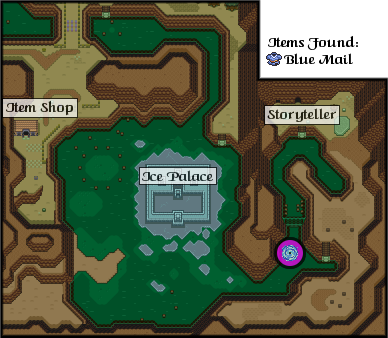 If you spoke to the storyteller near the Ice Palace, you might recall hearing about the thief who is said to be near the desert. Drag the trunk to the sleeping man in the canyon. The man will wake up and open the trunk. Inside, you will find the fourth Bottle. Near Death Mountain in the Dark World, you may have come upon a sign promising to reward the person who wears the Cape with a Piece of Heart. In the mountain cave nearby, follow the passage until it is blocked by a bumper. Don the Cape and slip past the bumper to reach the Piece of Heart beyond. Northwest of the Ice Palace lies a circular arrangement of stone which surround a shallow portion of the lake. Just as you learned near the Swamp Palace, there are strong relationships between the Dark World and the Light World. Swim to the shallow section inside the circle and use your Magic Mirror. If you do, you should end up on top of the island in the middle of Lake Hylia that contains another Piece of Heart. 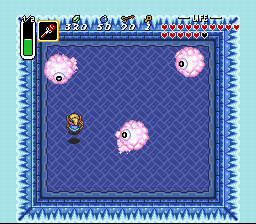 No matter how long you battle the dive-bombing Zirros and other creatures of Ice Lake, you will not discover a way to enter the Ice Island dungeon from the outside. 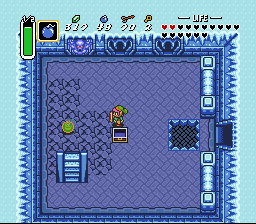 Instead, if you visit the central island in Lake Hylia which is in the same location as Ice Island, you may discover the Warp Tile concealed under the dark stone. The Warp Tile will transport you to the inner courtyard of Ice Island. 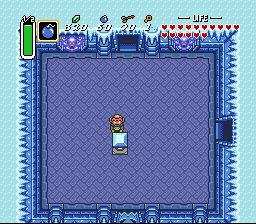 The only way to reach the Ice Palace is through a Warp Tile in the Light World. This magical entrance to the Dark World is located under a very heavy rock at the entrance to the Pond of Happiness. Since the Ice Palace is a very cold place and populated by creatures who were created by the magic of ice and snow, it only makes sense that a warm weapon will be quite useful. Those explorers who have command of the Fire Rod will find this device to be very useful in the chambers of the Ice Palace. A supply of Potions is also good to have as the enemies are very strong and in large abundance. The villain, Kholdstare, lurks deep in the palace dungeons. Close combat on ice can get very frustrating. A good strategy when battling multiple Pentagators is to use Ether Magic, which will freeze all the enemies, then proceed to smash them with your hammer. When doing this, magic refills are more likely to drop allowing you to keep you magic meter full throughout this dungeon. 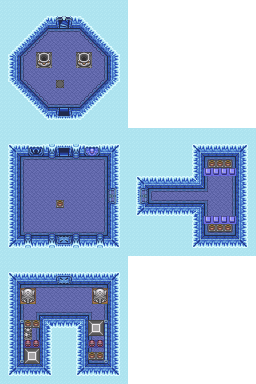 As you enter the Ice Palace, you will see two stone statues and a telepathy stone. However, once you step far enough into the dungeon, what appears to be an ordinary wall sculpture comes to life and attacks you. The monster known as a Tainon is only susceptible to the flames of the Fire Rod, so have it handy as you enter the Palace. Do away with the Tainon and you will be able to enter the room to the left. 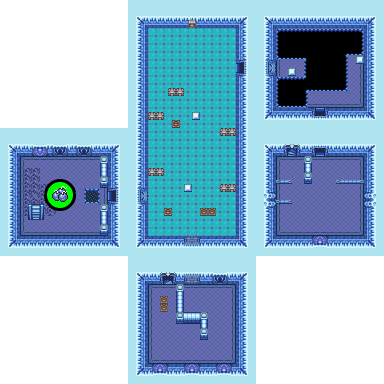 When you enter the room, you will be greeted with exactly the kind of environment you would expect to find in an Ice Palace: slippery icy floors. This means that positioning yourself accurately takes a little bit more of an effort, but not terribly so. There are three Baris in the room, and one of them possesses a Small Key, so defeat them all (when they're not electric) to find the key and collect it. Use it to unlock the door above and climb down the stairs to the first basement level. When you arrive on this floor, you will be in the simple room on the left. Two green Zols will rise from the floor to attack, but they pose little threat. Walk down to the lower left corner and step on the tile to open the door on the right. Walk through to the next room, and you reach a four way intersection. You can go in any direction but the direction you were moving when you entered the room. Start by pushing the center block right, and traveling south. In this icy room along the bottom, you will meet the Pentagators. Pentagators like to get a bit of momentum going before diving along the ice head first and colliding with whatever gets in their way. Defeat them with your sword or hookshot and open the treasure chest to reveal the Compass. When you're done, return to the room above. Now push the center block up, and head right, stepping on a tile which opens the shutter doors along the way. In this room, you will have to face Pentagators, a Bubble, and a "Bunny Beam" hidden beneath one of the skulls. The other skull hides the switch which you need to step on to open the doors. Running into the far right room won't get you anything at this time, so return to the left. As you go to push the center block left, you'll step on that same tile again, and now the door above will be open and available to you. Enter the top room. There are four red Baris to contend with in this room. 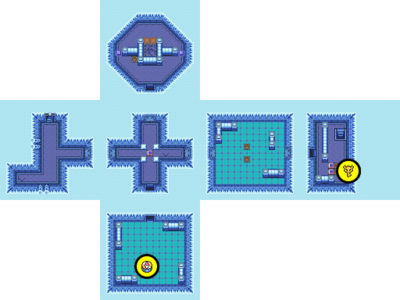 But the real puzzle in this room has to do with the Crystal Switch. Your goal is to place a bomb in the center of the room and fall into the pit that it creates. Obviously, when you enter, you'll need to hit the switch to lower the blue fence blocks. But in doing so, you'll block the pit with the orange blocks. You need to come up with a method of triggering the Crystal Switch while standing behind the blue blocks…something of a delayed response. One item that you have that has a delayed response is bombs. If you place a bomb near the switch, and run back to the other side, you should clear the blue blocks well before the bomb explodes, causing the blue blocks to rise and the orange blocks to fall, providing you with access to bomb the floor and fall to the floor below. You made it to this little secluded room, and you will be well rewarded. Get the skulls out of your way so that you can open the treasure chest and reveal its contents: the Big Key. Now you're ready to hunt down the large treasure chest of this dungeon. To do that, you need to return to the large sliding spike trap room on the third basement. Push the lower block to the left and the upper block up, and head out to the room on the left. At this point, you must retrace your steps and get back to the third basement floor as you did before, for your third visit there. As you fall to the floor, you will arrive in the center of the room with skulls providing access to the outer sections of it. However, as you step outside, you will encounter the largest Stalfos you have ever seen, the Stalfos Knights. They are strong, but they fall into a heap of bones when you strike them. Unfortunately, they don't stay down; they rise back up to attack again. However, if you can find a way to keep them down permanently, they won't be as much of a threat. The only way to keep them down is to blast their bones to smithereens, and there's no better way to do that than with a well-placed bomb. The bomb must explode before they stand back up, so place it quickly. When both Stalfos Knights are defeated, you are free to enter the room below. The floor in this room moves, so be aware of the danger that the spike traps pose. There are four blue Baris in this room, and one of them is in possession of a Small Key. Defeat them all to find and collect it. In addition to all of this, you must also contend with small black shadowy creatures called Baboos that escape from holes in the wall and scramble across the floor. On your way to unlock the door in the lower left corner, make sure that the Crystal Switch is set in the orange position, as you'll need to cross the orange blocks in the next room to continue. Enter the room to the south and pause a moment to get the timing of the fire bar down. When you're ready, make your way towards the lower left corner of the room, where a switch can be found under the skull that opens the door to the right. Wait again for the timing of the fire bar to permit you to safely run to the right door and enter the next room. In this small room, three green Zols will rise from the floor to attack you. Dispatch them, and enter the stairwell to basement level three. There's a lot going on in this little room when you return to this floor. First, you'll have to deal with a Stalfos Knight who guards the right side of the room. Take care of him, and use your Magic Hammer to pound down the pegs that block your access to the giant block. Lift the block to expose both a key and a "Bunny Beam" trap. If you're quick, you can cause the beam to crash into the wall before it reaches you. Collect the key and pound down the pegs on the other side. Another Stalfos Knight will appear to give you trouble. Take care of it, and remove the skulls below to reveal a switch. Stepping on the switch will reveal a treasure chest that contains a Map. If you study the map, you will notice a room to the right, with no apparent means of getting there. 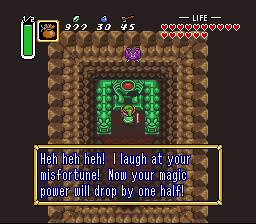 Killing the enemies and stepping on the switch didn't do the trick, so there must be something else you can try. The statue in this room may look like a few other statues you've already seen before, but this one is special. Try giving its tongue a tug. You'll notice that you can pull it out like a wall switch, and cause the door on the right to open. Run through it and it will lock behind you again. That's OK, because you've found the ladder that brings you up to the other side of the mysterious chamber in the first basement level. Head up there for visit number 2. 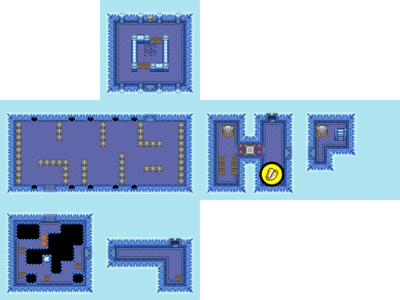 You will arrive on this floor in a room with an icy floor and a lot of Pentagators. Because of the way they are situated, they will attack you en masse. You must fight and defeat them all in order to gain access to the room above. When you head north, you'll enter a room with a rather large spike trap that bounces up and down the hall. Your options are somewhat limited. You can't head right because you don't have a key. The room to the left has a very important purpose, but you won't be able to realize it until you have the Big Key. So instead, you must run to the middle corridor, and out of the way of the trap. Wait for the trap to slide back down to the bottom, and make a run for the door at the top. 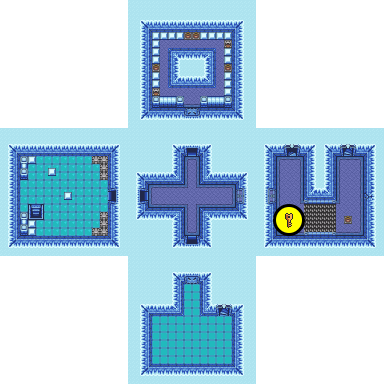 It contains a few skulls and a fire trap, along with a circle of tiles that fall away, forcing you to fall to the floor below. When you're there, you can either try to quickly get around to as many skulls as you can, or simply wait for the floor to open beneath you since you'll have no other choice. In the small U-shaped room on the right, you'll see a skull across the way from a bed of spikes. You can use the Hookshot to pull you safely over to it, then lift or destroy it to reveal a switch underneath. Step on the switch to reveal a treasure chest. Hookshot back over to the chest and open it to reveal a Small Key (do not use this key on the locked door to the left; it's much wiser to save it). Unfortunately now you're on the wrong side of the spikes from where you want to be. Either brave the danger and take the damage or use your Magic Cape to walk across the spikes harmlessly. Take the stairwell up for your second visit to the second basement. Assuming you collected the Big Key from the first basement floor, you're ready to enter the room to the left of the giant spike trap room. When it's safe to do so, run into the doorway on the left. You'll enter a room with an icy floor and a fire bar spinning around. Since getting up to speed on an icy floor requires different timing, you'll have to take that into account if you wish to reach the ladder on the other side of the room without getting nailed by the fire bar. When you reach the ladder, climb down for your second visit to basement level four. When you first fall down to the fourth basement, you'll arrive in a long icy room, with a number of spike traps, fire bars, and some Pentagators. You could run to the bottom, but you'll only find a shut door and a locked door. While a switch near the bottom of the room opens the shut door, when you enter it, you'll only be able to reach a pit that leads to the floor below. Instead, stay up at the top, and enter the door on your right. This room contains four red Baris, which are most easily defeated with your Hookshot. It will also come in handy since you need your Hookshot in order to navigate across the giant pit in this room. When you have a clear path to the block across the pit on the right, fire at it and pull yourself over. Once you're safely on the other side, you can access the door below. The next room contains four giant spike traps, and your goal is to get around the barrier wall to the staircase on the other side. If you happen to possess the Magic Cape, now is a good time to use it since it renders you invulnerable to the spike traps and you can navigate around the room without fear (provided you have plenty of magic). Take the staircase up to your second visit to basement 3. When you arrive, you'll be on the other side of the pit that you might have encountered earlier. As you explore the room, a Tainon will attack you from the wall, so have your Fire Rod ready. You'll see a treasure chest in the room, and if you open it, you might be disappointed to find that it only contains Bombs. However, that should serve as a clue to you that the use of bombs is important in this room. You might notice that the floor above the ladder is terribly cracked. If you experiment and drop a bomb on a portion of it, you will blow a hole through the floor. This hole will land you on the opposite side of the room below than the existing hole, so fall down through it. One last trip to this floor places you in the bottom room of the floor. As you walk across the room, green Zols will appear out of the floor, so attack them when they form. When you get close to the locked door at the top, a Tainon will leap out to attack you, so have your Fire Rod ready. 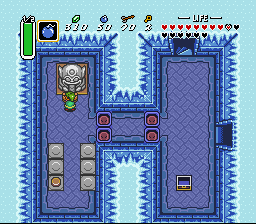 Unlock the door, and you'll be in the familiar long icy room. The skull closest to the door through which you arrived hides a switch that you can press to open the door to the left. Run through, and simply drop down the pit in the floor that is immediately in front of you, for your third visit to the fifth basement level. 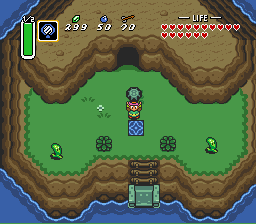 If you've followed the walkthrough, your first visit here should bring you directly to the left side of the left room which contains the large treasure chest. If you explored on your own, it's just as likely that you've ended up on this floor on the other side, or through the bottom room. 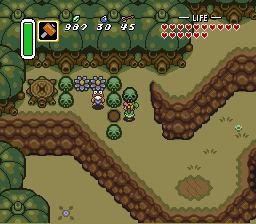 In accordance with the walkthrough, hopefully you have landed in front of the large treasure chest with the Big Key in your possession. Go ahead and open the chest, and you will receive a much-needed boost in your defense, in the form of the Blue Mail. Once you have it, push any of the blocks out to the right, and escape through the right door. In the next room, a Tainon will attack you. Blast it with the Fire Rod, and then study your surroundings. You don't need to go any direction other than up, and fortunately for you, the orange blocks are down, while the blue blocks protect regular blocks which are positioned around a gap in the floor. All seems well at this point, so proceed through the north door. In the top room, three red Baris and a Stalfos Knight will attack you as you approach the locked door at the top. Defeat them and head down the stairs. When you return after hitting the switch, run back to the pit room. (Actually, when you return to this floor, you might notice that the blue fence blocks which blocked off two pits on either side are now lowered, so you can fall down them if you choose to. If you do, you'll discover a very valuable fairy pond where you can replenish your health and restock your bottles with fairies.) With the orange blocks up and the blue blocks down, you might think that you're all set to solve the pressure plate puzzle. Unfortunately the blocks on the right side are not situated over the pressure plate, so pushing the right one in won't do you any good. And with the orange block up, your access to the left side is blocked. So you'll need to climb up to the floor above and drop down from the other side. So head to the room on the right. This room is loaded with skulls, a fire bar, and streams of Baboos that crawl out continuously from the holes. One skull contains a Small Key, and another hides a switch. Find the switch and step on it to access the room below. In this next room, you must attempt to avoid hitting a fire bar while traversing a slippery floor to the door on the left. You can utilize the Magic Cape to make this experience much easier, but be careful not to slip off any of the edges. In the next room, there are two blue Baris to defeat. The skull in the corner hides a switch which, if stepped on, reveals a treasure chest that contains another Small Key. Collect it and climb the steps to the room above, your third visit to basement level four. Now that you've landed on the "right side" of the orange blocks, which is the left side, head through the door and push the movable block down into the pit. Feel free to tumble in after it, and continue with your second and final visit to basement floor six. Now that the block you've pushed landed very near to the switch, break the skull that covers it, and push the block onto the switch, permanently opening the door to the room below. Pass through the door. There are a variety of interesting things including some visible Baris, and some Baris that are hidden under the right block. The object of interest to you, however, is the block on the left. Unfortunately, it takes a bit of work to reach. First you must remove the skulls in the way. Then you must tug the right statue out of the way so that you can gain access to the bobbing pegs beneath it. Break out your hammer and smash the pegs, and finally lift the giant block over your head. A hole will be revealed, and it leads directly to the dungeon's boss. At first, Kholdstare appears pretty harmless, being stuck in a giant block of ice. 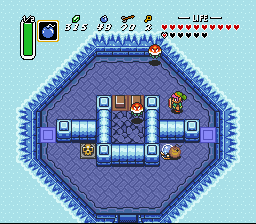 Naturally, you can use blasts from the Fire Rod to thaw the ice and release him so that you can ultimately kill him. However, once he breaks free of the ice, you'll soon discover that he is not one enemy, but rather three. And they will each split up and begin to bounce around the room and attack you. While they do this, blocks of ice will drop from the ceiling and shatter into four pieces. Do your best to avoid them while you focus your attack on one Kholdstare at a time. Rely most on your sword for quick successive strikes, but a few blasts from your Fire Rod (if you have magic left) can speed up the process of defeating each one. When you defeat the final remaining Kholdstare, you will be rewarded with a Heart Container. Collect it, and the fifth maiden crystal will be revealed. The fifth maiden informs you that while your ancestors were capable of amazing and mystical things, you of the current generation don't possess the same amount of power, since the bloodline has been diluted over time. 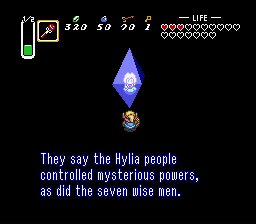 But by combining the powers of the descendants of the seven wise men with the descendant of the courageous Knights, you just might stand a chance against Ganon. With that said, your next trial awaits you in Misery Mire. That is… if you can figure out how to reach it. This page was last edited on 3 March 2013, at 12:29. This page has been accessed 113,676 times.